Clarksville, TN – First baseman Parker Phillips went 5-for-5 with three RBI and Austin Peay State University’s baseball team ended its four-game losing streak with a 7-5 victory against Evansville, Tuesday night at Raymond C. Hand Park. Phillips became the third Govs hitter to post a 5-for-5 outing this season – all three occurring in the last two weeks. The redshirt freshman opened his day with a leadoff home run in the second that tied the game, 1-1. Phillips helped extend the lead in the third, driving in a run with a single before he scored on designated hitter Brett Newberg’s two-run home run., giving APSU a 5-1 lead. Evansville (15-32) chipped away at Austin Peay’s lead with single runs in the fifth and sixth innings. The Purple Aces then used a pair of Govs miscues to tie the game in the eighth. After the first two batters of the inning reached base on an error and a hit batsman, third baseman Troy Beilsmith leveled the game with a two-run single. Austin Peay (21-25) responded immediately with Phillips again supplying a hand. Third baseman Alex Robles was hit by a pitch to start the inning and rushed home on left fielder Cayce Bredlau’s double into the left field corner. Two batters later, Phillips doubled into the left center gap to drive in Bredlau and extend the Govs lead. Robles moved to the mound to start the ninth inning and notched his season’s first save with a pair of strikeouts against the four batters he faced. The late burst made a winner of Govs reliever Michael Costanzo (3-2), who struck out three batters over two innings, allowing two runs (one earned). In addition to Phillips’ 5-for-5 outing, catcher Alex Sala notched a hit in his first three at-bats after entering the game and ended the day 3-for-5 at the plate. Evansville reliever Ryan Brady (0-3) was tagged for the loss after allowing two runs in an inning of work. Beilsmith paced the Purple Aces offense with a 3-for-4, two RBI performance. 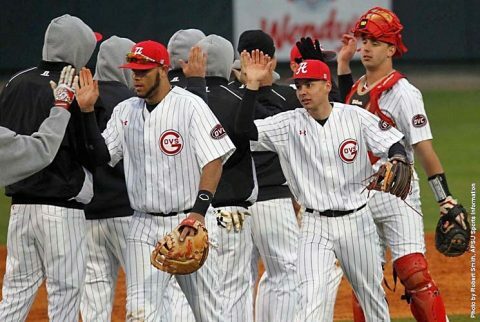 Austin Peay closes out its 2017 home slate with a 1:00pm, Wednesday contest against Lipscomb. Fans attending Wednesday’s contest will receive free admission courtesy James Corlew Chevrolet Cadillac, who will be recognized prior to the contest for their donation of the videoboard at Raymond C. Hand Park.